Taking a coherent and logical approach, this book describes the potential use of co-ordinated multipoint systems supported by radio over fiber. It covers an impressive breadth of topics, ranging from components, subsystem and system architecture, to network management and business perspectives. 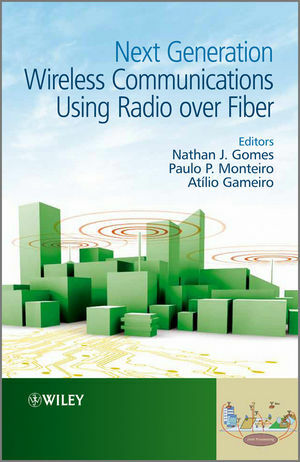 The authors show the importance of radio over fiber in eliminating or mitigating against the current, perceived barriers to the use of co-ordinated multipoint, and the drivers for standardisation activities in future mobile/wireless systems over the next few years. The book brings together the system concept for centralized processing, including what is required for co-existence with legacy wireless systems, the algorithms that can be used for improving wireless bandwidth utilization at physical and MAC layers and the radio over fiber network and link design necessary to support the wireless system. Other important research is also covered as the authors look at compensating for radio over fiber impairments and providing simple network management functions. A study of service provision and the business case for such a future wireless system is also fully considered. This book comes at an important time for future wireless systems with standardization of fourth generation wireless systems still ongoing. The content enables readers to make key decisions about future standardisation and their own research work. The business analysis also makes the book useful to those involved in deciding the future directions of telecoms organisations. This information will be core to their decision-making as it provides technical knowledge of the state-of-the-art but also system level assessments of what is possible in a business environment. Dr Gomes is Reader in Broadband Communications at University Of Kent, UK. He received a BSc degree from the University of Sussex, in 1984 and a PhD degree from University College London, in 1988, both in Electronic Engineering. From 1988 to 1989, he held a Royal Society European Exchange Fellowship at ENST, Paris, France. Since late 1989, he has been at University of Kent and has led a number of national and EU projects and published extensively in international journals and conferences. Paulo Monteiro received his diploma and his PhD degrees in Electronics and Telecommunications from the University of Aveiro, Portugal. He is Optical Networks Technology Manager in the Transport, Aggregation and Fixed Access Department of Nokia Siemens Networks. He is also an Associate Professor at the University of Aveiro and Researcher at the Instituto de Telecomunicações. He was the project coordinator of the Large-scale integrating project FUTON. He has authored/co-authored more than 15 patent applications and over 200 refereed papers and conference contributions. Atilio Gameiro received his Licenciatura and his PhD from the University of Aveiro in 1985 and 1993 respectively. He is currently a Professor in the University of Aveiro, and a Group Head at the Instituto de Telec., Pólo de Aveiro, Portugal. His industrial experience includes a period of one year at BT Labs and one year at NKT Elektronik. He has published over 120 technical papers in international journals and conferences. He has been involved and has led several national and European projects in the field of mobile communications.